How important is pricing your Loudoun real estate when it is time to sell? At AGC we knew the impact – although we were still surprised – even after 20+ years in real estate – by the results of this recent National Association of Realtors survey. 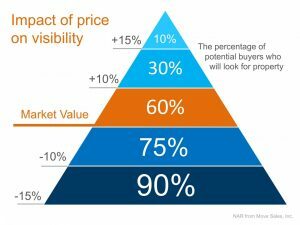 Turns out that even if you price your home AT MARKET VALUE when you decide to sell it (not a little above “for negotiation purposes”) only 60% of potential buyers will even SEE IT! That is pretty powerful! An accurate price is one of the BIGGEST things you can do to sell your house. At Ask Gina & Company our agents perform a thorough market analysis to determine your property’s value in our local real estate market. We won’t artificially inflate it to test the waters or win the listing – that isn’t doing our clients any justice. AGC prefers to provide value from our experience and knowledge of the current Virginia market conditions to come up with what we think will generate the best possible net price for YOU in the end. History shows that a property fetches the most money when it is staged well, priced correctly and doesn’t languish on the market. With just a bit more than half of the Virginia homebuyers even LOOKING at a properly priced home, it would only hurt the bottom line more by trying for a higher number.